Sign in to take advantage of exclusive coupons. Hiland Dairy makes it easy to save on fresh, wholesome dairy products with valuable online coupons you can print and take to your grocer. 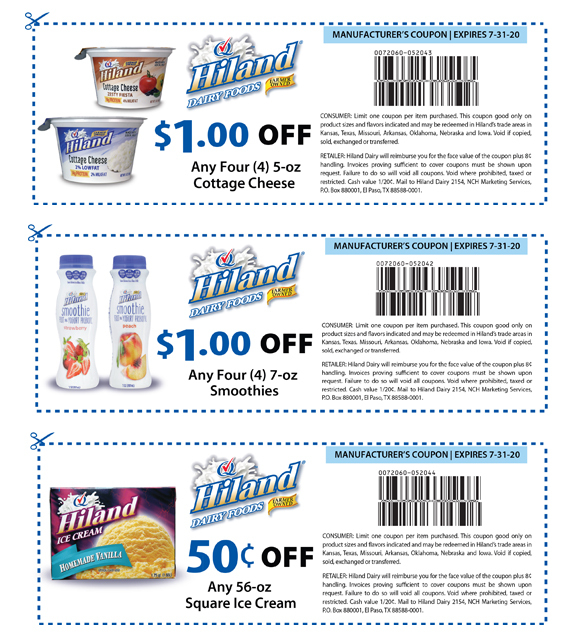 Check with your grocer before use as not all grocers accept all Hiland Dairy coupons. Register today! In an effort to provide greater security for our customers, we've revamped our coupon sign-up process. To receive our exclusive coupons you'll need to sign-up here, even if you have a login from 2012 or before. It's easy, secure, and most importantly, you'll save money! Hiland Dairy Online Coupons are good for one time use only per customer. Redemption of online coupons is at the sole discretion of each individual retailer. Hiland Dairy cannot guarantee online coupon redemption or confirm participating stores; you may want to check with your retailer(s) of choice before attempting to redeem online coupons. By signing up, you will be able to access and print Hiland Dairy coupons. New coupons are offered every 30-60 days. Sign up for our Coupons and eNewsletter and you will also be notified of coupons available for printout that coincide with periodic mailings or special offers. PC COMPUTER - We recommend using Google Chrome as your internet browser on a PC computer when printing our online coupons. MAC COMPUTER - We recommend using Safari as your internet browser on a Mac computer when printing online coupons. Due to the complexities associated with individual computer systems, printers and Internet browsers, we are unable to offer any technical support regarding issues with the printing of online coupons. Please contact your Internet service provider and/or consult the owner’s manual of your computer or printer for further assistance. Read our privacy and coupon policies.